The nominations for the 2019 Oscars have been announced, with this year’s Irish contingent picking up four nominations for the 91st Academy Awards ceremony. Yorgos Lathimos’ ‘The Favourite’ has received 10 Academy Award® nominations across 9 categories including Best Picture, Best Director, Best Screenplay, Best Costume Design, Best Production Design, Best Actress in a Leading Role for Olivia Coleman and two nominations for Actress in a Supporting Role for both Emma Stone and Rachel Weisz. 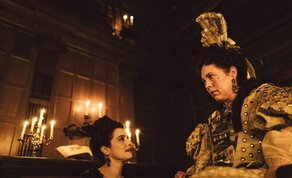 Irish cinematographer Robbie Ryan received a nomination for his work on ‘The Favourite’. He is joined by Lukasz Zal (‘Cold War’), Caleb Deschanel (‘Never Look Away’), Alfonso Cuarón (‘Roma’) and Matthew Libatique (‘A Star Is Born’). Yorgos Lanthimos picked up his first nomination for directing, while Irish producer Ed Guiney of Element Pictures was nominated for Best Picture. Louise Bagnall and Nuria Gonzalez Blanco’s ‘Late Afternoon’ has been nominated for Best Animated Short. The film, which is produced by Cartoon Saloon, was nominated alongside ‘Animal Behaviour’, ‘One Small Step’, ‘Bao’ and ‘Weekends’. ‘Late Afternoon’ tells the story of an elderly woman as she drifts back through her memories. She exists between two states, the past and the present. It received the IFTA for Best Short Animation at the IFTA Film & Drama Awards in 2018. Vincent Lambe and Darren Mahon’s Irish short film ‘Detainment’ is nominated for Best Live Action Short. The film follows the story of two ten year-old boys being detained by police under suspicion of abducting and murdering a toddler. A true story based on interview transcripts and records from the James Bulger case which shocked the world in 1993. The 91st Academy Awards® takes place in Los Angeles on Sunday, February 24th.